If you’re new to writing, and don’t know about or use style sheets, it’s time you learned. They’re really helpful as you write or edit. A style sheet is a type of template file that defines a set of style standards regarding the look of a document. Its purpose is to ensure control, consistency and uniformity over every word and line in the document. In word processing and desktop publishing, a style sheet contains the specifications of a document’s layout, including such parameters as page size & margins; font style, size & color; line spacing; paragraph indents; heading design; and bullets. When you use style sheets, you can change any style once (in the style sheet), and your whole document will be instantly and automatically updated. For example, if you decide that a particular heading should be of a different type font, you don’t have to search through the whole document for each item with that style and change it manually. A style sheet allows you to make the change once within the style sheet and all headings of that type will change automatically. This is a huge benefit for writers and editors. Style sheets are useful because you can use the same style sheet for many documents. For example, you could define one style sheet for personal letters, another for official letters, and a third for reports. A style sheet is typically embedded as part of an electronic word-processing document. This style sheet applies to the entire document. However, in a specific section of the document, the overall style sheet can be overridden (by inserting breaks). Some publishers may follow the Chicago Manual of Style, while a newspaper may follow the Associated Press (AP) Stylebook. In addition, publishers may have in-house guidelines or rules that writers need to follow. It’s most beneficial to create or import a style sheet before you start writing. That way, when you’re finished, your document will be pretty much look like you want. 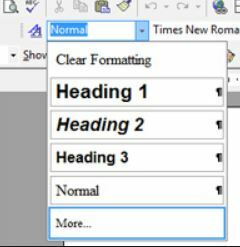 However, you have to be sure to select the correct style for every heading, paragraph, etc. as you go along. On the other hand, some writers feel that nit-picking the details of style assignment takes away from the creative act of writing. In that case, it might be best to apply styles after completing the first draft. If you’ve already written all or most of your book, you need to go back through it and apply styles to titles, headings, paragraphs, graphics, etc. Most importantly, you need to be consistent in applying styles. Otherwise, they fail to meet their purpose. Just know that every word, line, paragraph, etc. in a document must have some style applied to it. When using word processing software (e.g., Microsoft Word©), people just start typing. When they want a heading, they often type the words, highlight them, and then manually bold them and/or set a different font size. While it looks great, what they’ve basically done is used the resident “Normal” style and made changes to it. It’s usually not a good idea to use the resident “Normal” style in a document, because when the work is published, the publisher (e.g. Amazon Kindle) will determine what they think “Normal” should look like. However, it may not look anything like what the author had in mind. A style sheet tells the publisher what font, size, spacing, etc. the author wants. Also, many people tend to click “Enter” as many times as it takes to get the line spacing they want. Again, that’s ineffective for publishing. The style of a paragraph or heading needs to have that information embedded in its style. Turning on the “paragraph” icon in the toolbar allows you to see the extra “Enters” as paragraph markers. Again, the number of line spaces after a paragraph should be embedded in that paragraph’s style. Another thing people tend to do when they want a line to start in from the left side (indent) is to keep clicking the “Tab” button. That, too, is a no-no. Again, a style sheet will determine how much space should precede a first-line indent—or the whole paragraph. This depends on the word processor you’re using. Check a printed or online resource for specific how-to’s. Consider adding a style sheet to your writing tasks. You’ll find that it makes your work look much more professional. It keeps you in charge of the look of your document, and does not default to a publisher’s pre-determined styles. And best of all, it’s easier to make consistent changes as you work on your manuscript, since changing a style changes its application throughout your document.